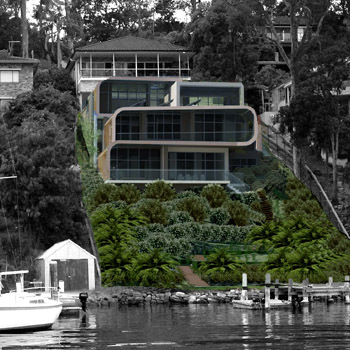 The fluidity of this design house was brought about by its intimate relationship with and proximity to the harbour. Overlooking the Royal Motor Yacht Club Broken Bay at Newport in Sydney's Pittwater the site is exceedingly steep and difficult to access by car. The site was recently sub-divided and was a greenfield site - very rare in Sydney and almost unheard of along the water's edge. 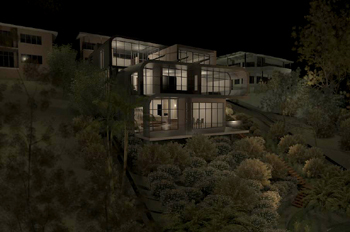 The design captures magical views from every room and the immediate environment captures magical views to a new house. The fluidity of the roof curves down along the walls and anchors the house into the steep ground. The site is exceedingly steep so the design was therefore inverted with the garage and carparking on top and living areas below. The site is exceedingly steep and as a result the house spans several levels yet still manages to retain the majority of the site as landscaping. The house sits comfortably within the site, with portions of the building progressively set back so that no point along the building shows more than a 2-storey house. 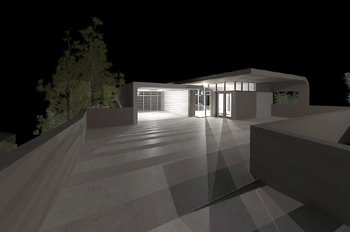 The garage and turning area sits atop the house with a vehicle turntable to enable to cars to enter and leave the site in a forward direction. The fluidity, balance and anchoring of the design to the site pays homage to the sailing boats immediately in front of the site. 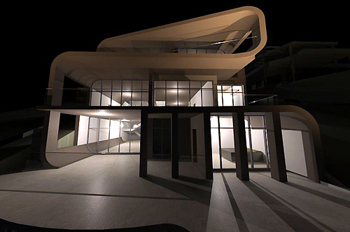 All design work has been modelled on the computer before construction enabling the building to be rendered to see its relationship to the site. Site features: land rises sharply from water. 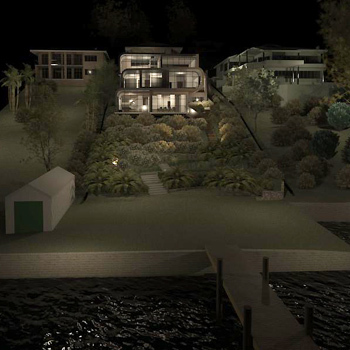 Expansive views of Pittwater and sailing club. 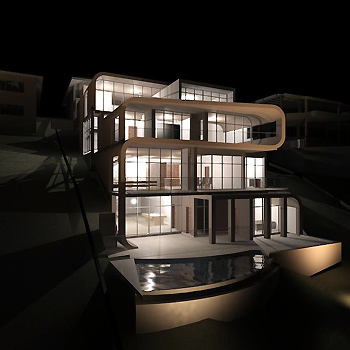 Architecture highlights: Enormous glazing offering panoramic views, light filled interiors with open plan living areas. Very large bedrooms also with views. Very large kitchen.